Many of us fell hard for it. 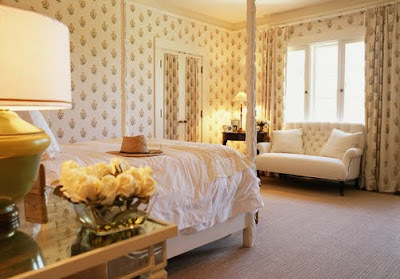 Jill Brinson's home feautured in House Beautiful is definitely one of my favorite homes to date. I love everything about it. But one of the touches that hit closest to home for me was the blockprint paisley. Anyway, pasiley's in my heart & since it's making an appearance in so many beautiful rooms these days I thought I'd share some of my favorites. 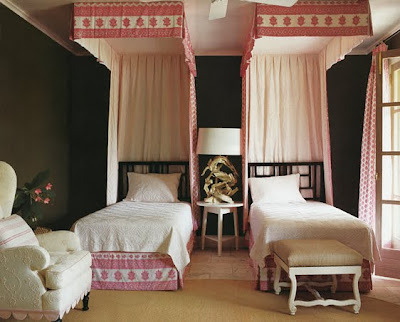 Do you remember this insanley beautiful bedroom (below) by Tom Scheerer? 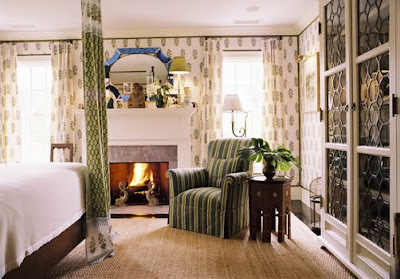 (House Beautiful) Love the rough hewn beams against the curvey bed. The duvet cover is by Les Indiennes and now I want one. 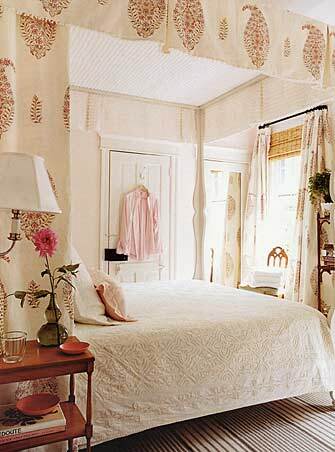 This bedroom below is just a perfect paisley cocoon! 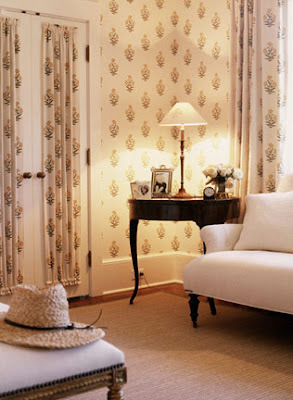 It's by Cathy Kincaid (featured in House Beautiful & photographed by Reed Davis.) 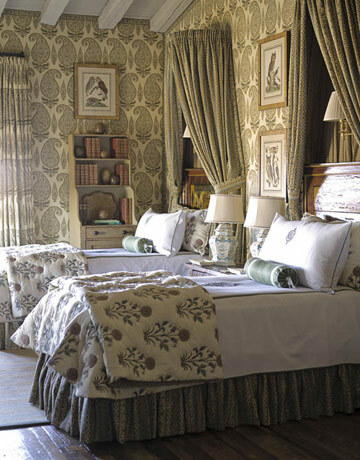 The paisley on the walls & curtains is called Kashmir & is by Michael Smith. Tom Scheerer uses lots of blockprints in his work. The next series of rooms were designed by him. How amazing is this canopy below? Below is a happy paisley headboard. Notice it's in the same fabric as the chair a few pics up? 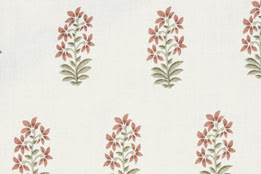 Below is another gorgeous print from Les Indiennes and it reminds me a bit of my beloved Pottery Barn quilt. 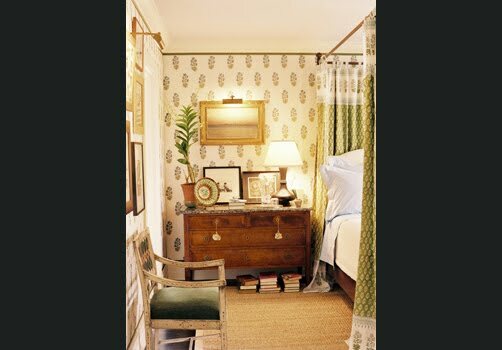 And finally we've got some rooms & fabrics by Peter Dunham. 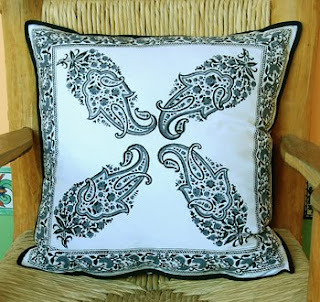 Below, the pillow on the chair is Kashmir Paisley by Peter Dunham. Anyway, wishing for a pretty green (inexpenve) version for my own home! What about you on paisley? Yay or nay? ps- also check out Haven & Home's post on blockprints. and Thank you to Jennifer Sergeant for doing an article on our Better Homes & Gardens feature on her new blog, DC by Design! I SOOO love all of these prints, stunning. They remind me of my trip to India. 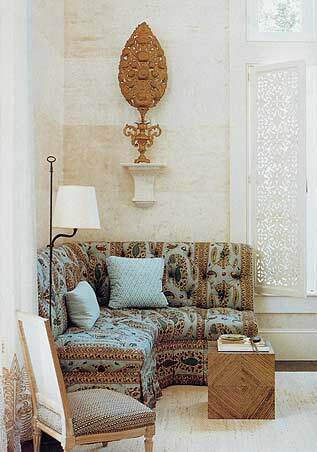 Ive been thinking of finding a stencil of the blockprint type and trying it out on roman shades to create that look!! thanks for the inspiration, so lovely. Love this post.......I go gaga for paisley! You are a girl after my own heart, I LOVE paisley. I am a closet paisley lover. Yay, very much a paisley fan. You're right, people either love it or hate it. I Love it ! I just made draperies for my Dad's sunroom out of paisley fabric and they love it too. 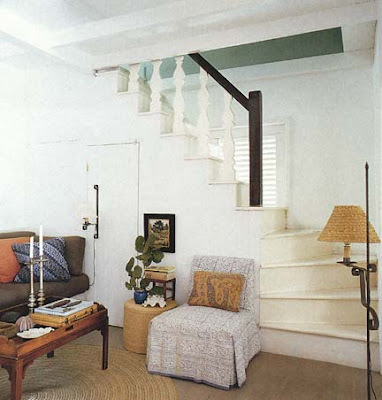 oooh, I love this post because handblocked prints (and Tom Scheerer) are my favorites! Saffron Marigold has some good cheaper alternatives. 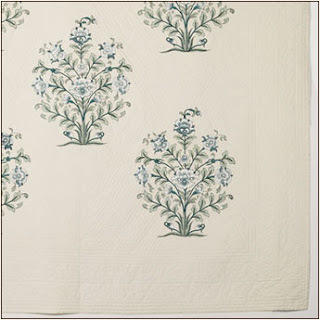 I posted some of my favorites ( http://filedforlater.blogspot.com/2009/12/hand-blocked-fabrics.html ), but I haven't heard anything about the quality. Has anyone actually ordered from there? Oh, I love the paisley. It reminds me of feathers. 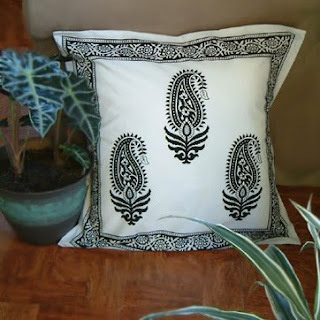 :o) I'd say if you are looking for a cheaper way to get some paisley pillows and if you have some artistic talent, grab some green fabric pens and embellish a plain pillow cover on your own. Or maybe you could trace a design if you don't have the drawing talent. I now exactly which pottery barn quilt you are talking about. I loved it too. You might like the quilts they have at Raksha Bella. They have some pretty hand blocked quilts. Yay to paisley! Loved your images! Paisley is so easy to love! I have always loved paisleys. Anytime I show a client paisley they barely look at it. I have never been able to sell it yet. But I do think it's wonderful as you do! Great post Lauren! Love paisley - in small classy doses! Paisley has definitely grown up. I love the new interpretations and the examples you've shown are great. Too bad you couldn't find that PB quilt. Thanks for the pillow plug. Hope you , the family and the new little guy are doing well. Love to look at it, don't wanna live with it. But you found some wonderful pictures of things that I LOVED looking at! I'm currently obsessed with paisley prints. Linen and paisley. Thanks for the entry. I loved it! Lauren..I love paisley too...but prefer when there are only 2 or 3 colours in the print. 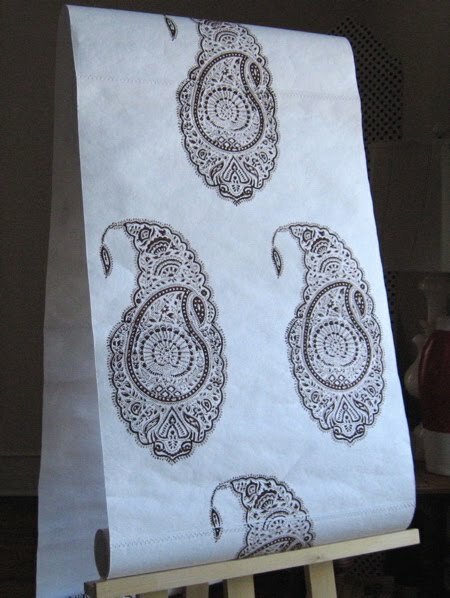 I love the modern versions of large paisley prints without too many colors going on, etc. You have shown some awesome examples. Love paisley even though I dont use it much but keep buying fabrics with paisley prints !!! I share your love of paisley, too. One of my fave childhood pieces of clothing is a paisley culottes dress, lol. Thanks for the great pics! 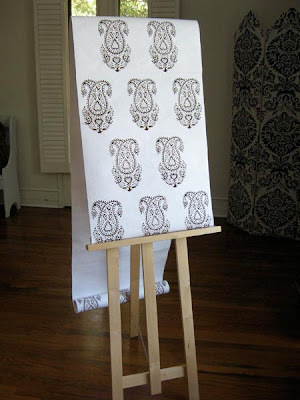 I just made 9 foot curtain panels for our living room windown in a gorgeous paisley. Love them! Lots of great examples. My favorite client fell in love with a paisley fabric for two fabulous chairs, great curves and nailhead detail. I tried to talk her out of them because I though they were too busy and would take away from the details....she still loves them. Oops!? Love this blog! Look forward to it every early morning! Finally signed up. I have a store in San Antonio and you are so right about either loving paisley or hating it. I love it. When a client tells me they hate it, they get "the look". I have to contain myself. I remember that PB quilt! Paisley has always reminded me of something from Biology class. So I don't always like it. 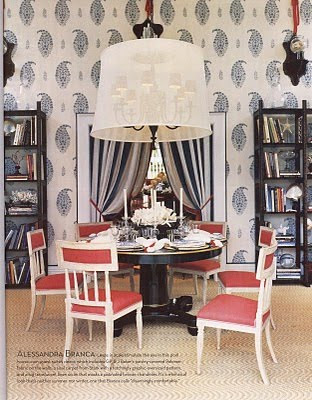 I do love the blue and white room! When I was 7, I begged to change my name to Paisley! Many, many thanks - so fun to be included among photos of some of my most favorites! I hope you get your green paisley! Hmmm, not a big fan of paisley. Of course, I am a guy. I would guess that paisley appeals more to women. I just tried on a dress with an oversized, almost abstract paisley. A stylist picked it out, and it was pretty ... but I just couldn't do it. Too not me. 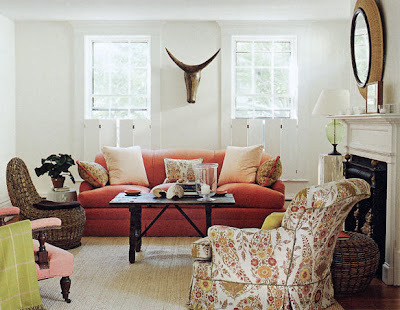 But I love all of these photos, so obviously interiors are a different story! I think I remember that quilt! Never "loved" or "hated" paisley....thanks for making me think more about it! The images are lovely! 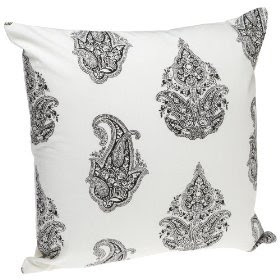 I've always been a fan of paisley, but I love this fresh take on it in the pillows you featured. I also LOVE paisley prints. I purchased a few meters of black onyx by Waverly last year. It is a beautiful black paisley print fabric. I have made throw pillows, a memory board, table runner and now am recovering a chair with it. I have loved paisley since I discovered some gorgeous paisley print fabric my mom had in her fabric bin back in the late 70's when I was hand sewing dresses for my Barbies! It has been a love affair ever since. Thanks for sharing the inspiration photos! 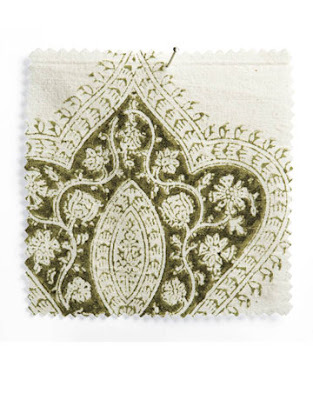 LOVE LOVE LOVE Les Indiennes and block-print paisley in general! Lauren, I discovered your blog a month or so ago, and have so enjoyed your posts. Thanks for this latest -- and, yes, I too love paisley! Hello Lauren, I've recently discovered your blog and have really enjoyed it, thank-you! Love paisley! Love the images you have posted and your style! My master bedroom duvet and euro shams are paisley print and my cream, matte lasse coverlet has a paisley pattern. 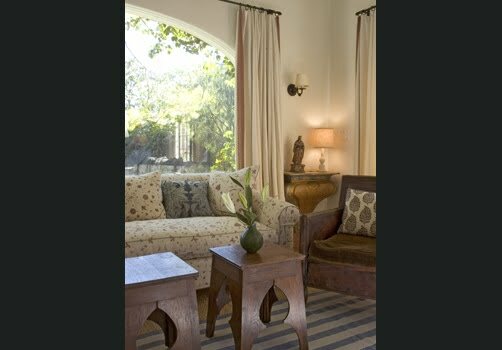 Wish I could find some inexpensive block print drapes for my living room. 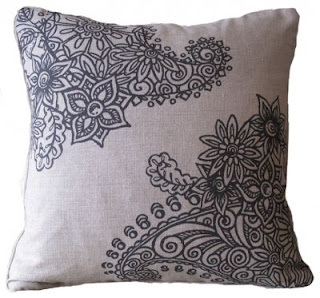 I love paisley and fell in love with those pillows of Jill's but then looked at the price. Oh my, hmmm could I make them somehow, haven't block printed in 3 decades. My mother made me paisley orange pants when in high school and I loved them and my friends can still remember them after 40 years. If you love paisley once then it never goes away. Hello, I am new to blogging and LOVE your blog. . . Stunning, Stunning, Stunning, you and your husband are adorable! I will be back to visit. Please stop and visit me sometime! Thanks for the shout out and this fantastic post!!! missed this somehow, thanks for the shout out - love lvoe love love love this!!!!!!!!!!! the best!! love it. hehe.